Claire Alexander and Katie Salley attended the International Society for Psychoneuroendocrinology Conference (ISPNE) in Zurich, Switzerland. Both have actively furthered their academic interests through undergraduate research, specifically through their work in the emotion and stress physiology lab of Michelle Wirth, visiting assistant professor in the Department of Psychology. Wirth’s lab performs research on the physiology of stress, emotion, and social motivations, with a focus on neuroendocrine systems. 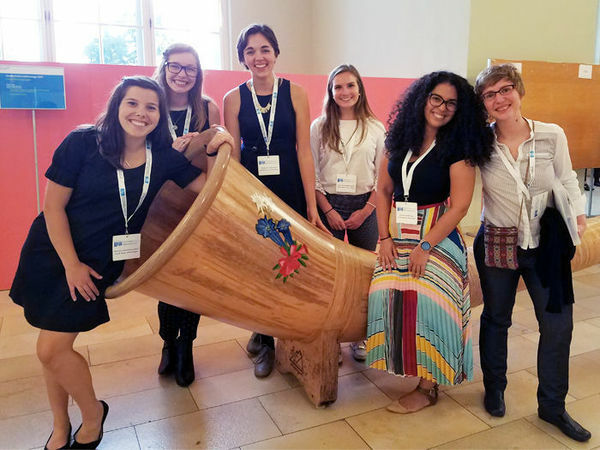 The ISPNE Conference provided the perfect opportunity for Wirth, Alexander, Salley, graduate student Brandy Martinez, and recent graduates Marissa Koscielski and Natalie Pottschmidt, to explore recent developments in psychoneuroendocrinology. Psychoneuroendocrinology is the study of how different hormones act in the brain and body to impact cognitive and physical functioning. Wirth’s group interacted with some of the top names in the field and participated in discussions about cutting-edge research that relates to stress, lifetime health outcomes, and mental dysfunction. Talks ranged from discussing the health effects of stress over one’s lifespan and exercise’s impact on stress reactivity. Additionally, the students networked with possible future collaborators and mentors, gaining new perspectives on interdisciplinary research. “International conferences open the doors to more productive conversations and collaborations between scientists, and that was clear from the number of international friendships and teamwork I witnessed,” said Alexander. In the future, Alexander hopes to do work related to neurological injury and dysfunction, and is completing her senior thesis on concussions. She is applying to graduate and research programs with a long-term goal of practicing clinical neuropsychology. Salley plans on taking a gap year before applying to medical school, with the career goal of becoming a physician. Originally published by Nicholas Barella at science.nd.edu on November 15, 2017.